Bunch of fresh herbs of dill or fennel , parsley and thyme. Scrub the beetroot and if large , cut into quarters, If small bake whole. Cut a piece of heavy duty foil large enough to form a parcel to bake in. Place beetroot on the foil and add a handful of thyme on the stalks, which can be removed once cooked. Season with ground salt and black pepper. Add the balsamic vinegar and olive oil, and seal the foil like a parcel. Bake in oven for 30 minutes and keep sealed until ready to serve. While the beetroot is cooking put the lentils in a pot and boil for 15-20 minutes. Do not add salt as it toughens the skin of the lentils . The lentils should be firm and crunchy, so don’t overcook them. Just before serving toss the lentils in the vinaigrette dressing. Chop up handfuls of fresh herbs of dill/fennel , parsley and thyme, and toss into the lentils. 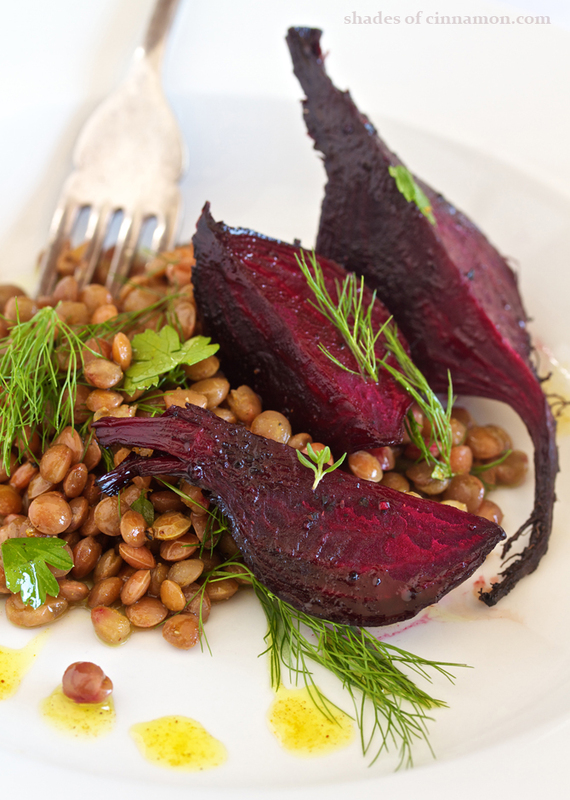 Plate the salad with the lentils in the middle of the plate and gently place 4 beetroot quarters to the side of the lentils.